There are a whole bunch of reasons we love Leh-Ladakh; the remarkable view, the clean, pure air, the magnetic culture, the hairstyles. The (rumoured) last descendants of the Aryans, the ‘Dropka' tribe of Ladakh are celebrated for their hair-styles as much as for their legacy. The women grow out their hair and wear it in a series of long braids, giving them an edgy look. For days you’re feeling adventurous, or just in the mood for something different, the Ladakh hairstyle is just what you need. Step 1. Divide hair into 2 sections in the middle from hairline to nape of neck. Step 2. Pick up a section of hair from the forehead and divide that into three sections. Step 3. Pick up the section of hair from the temple and weave into the other two sections. Step 4. Next pick up a piece of hair close to the middle parting and weave into the other two sections. Step 5. Continue braiding in this manner, maintaining the braid in the centre of this section. Braid till you reach the nape of your neck. Step 6. Repeat the same braid on the other side. Step 7. Continue a regular braid from your neck till you almost reach the end of your hair. Step 8. 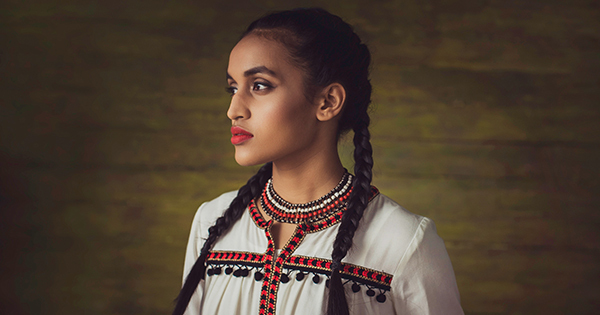 Fasten these braids with a hair elastic and you’re ready to channel your inner exotica!